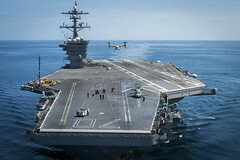 In preparation for the planned replacement of the C-2 Greyhound, USS Carl Vinson (CVN 70) received a V-22 Osprey from Marine Operational Test and Evaluation Squadron (VMX) 1 for landings and takeoffs, June 12. 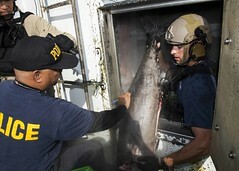 The recently completed a 40-day joint mission in the Central and South Pacific was part of the Oceania Maritime Security Initiative, which helps combat transnational crimes, enforce fisheries laws and enhance regional security. 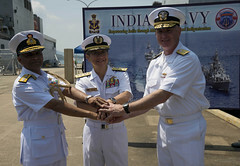 Exercise Malabar kicked off June 10 with a welcoming ceremony in Sasebo, Japan, for participating American, Indian and Japanese sailors. 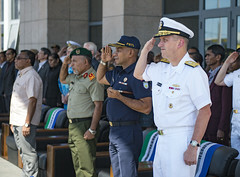 Chief of Defense Force Major General Lere Anan Timur hosted a Pacific Partnership 2016 opening ceremony June 8 in Dili. 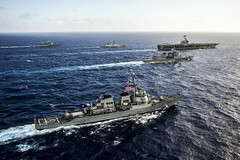 Naval ships, aircraft and personnel from India, Japan and the U.S. will participate in the annual exercise Malabar 2016, June 9-17, 2016. 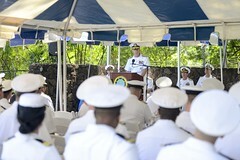 U.S. Pacific Fleet staff gathered to pay tribute to naval heroes during the commemoration ceremony at Pearl Harbor headquarters, marking the 74th anniversary of the Battle of Midway, June 7. 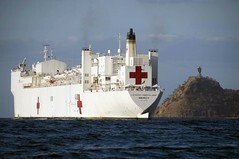 The hostpital ship USNS Mercy (T-AH 19) arrived off the coast of Dili, Timor-Leste, June 8 for the first mission stop of the 2016 Pacific Partnership mission. 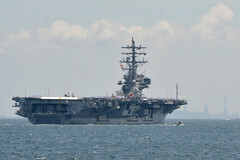 The Navy's only forward-deployed aircraft carrier and crew kicked off a regional patrol June 4 after departing Fleet Activities Yokosuka, Japan. 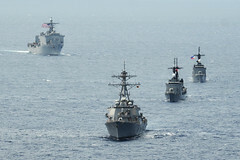 The U.S. Navy and Marine Corps will join the Armed Forces of the Philippines June 6-10 for CARAT Philippines 2016. 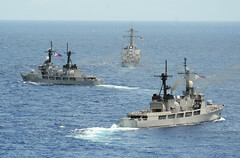 The U.S., Philippine, and Royal Malaysian navies are scheduled to conduct the coordinated multilateral training, June 4.